Paraphrase: One-way, outbound advertising messages should be replaced with contextual conversations. Example: Airbnb successfully engaged with Craigslist users who were looking to rent or lease a room. Rather than just targeting, they worked to build a native experience. Realistic? Yes, if you can identify your niche, become an active member of it, showing your value in context. Paraphrase: Companies should support the interests of stakeholders such as employees and communities. Example: Outdoor gear-maker Cotopaxi supports farmers in its supply chain because its consumers are keen on sustainability. Realistic? Depends. If you’re a mega-company you can create your own foundation. If you’re a start-up, the appropriate cause or level of support might not be so clear. Either way, research is required to determine what will resonate with your stakeholders. Paraphrase: Companies should drive engagement with articles as a way to break through and change the narrative. Example: In the case above, Cotopaxi should provide outdoor gear enthusiasts with a forum to participate in sustainability efforts. Realistic? Yes, every company can encourage some level of participation as part of its online and offline PR, etc. Paraphrase: Companies should give online visitors every opportunity to chat, as today’s customers much prefer texting to speaking. Example: Go to any SaaS site. Realistic? Depends. It’s important to invest in the tools and channels your segments prefer. Paraphrase: Companies will benefit from having dozens of integrated databases that automate customer interactions. Further Translation: Rather than just automating email campaigns from a Marketing Automation system, companies should integrate the many SaaS handling other touchpoints. So a multi-channel campaign could be fed by data from web content management tools, social selling tools, social media tools, event management tools, and ERPs tracking subscriptions/payables/etcetera. Realistic? It’s going to cost you. I’ve watched companies large and small constantly trying to connect technology across silos. Doesn’t mean it’s not an admirable goal, but like Atlanta roadwork, it’s never done. I won’t argue that these marketing “megatrends” are desirable – I’m simply wondering whether all are realistic 2018 goals. Seems reasonable for mega-companies and start-ups alike to budget amply for contextual marketing and participatory forums. But the technology-stack-data-integration issue is an ongoing business challenge. 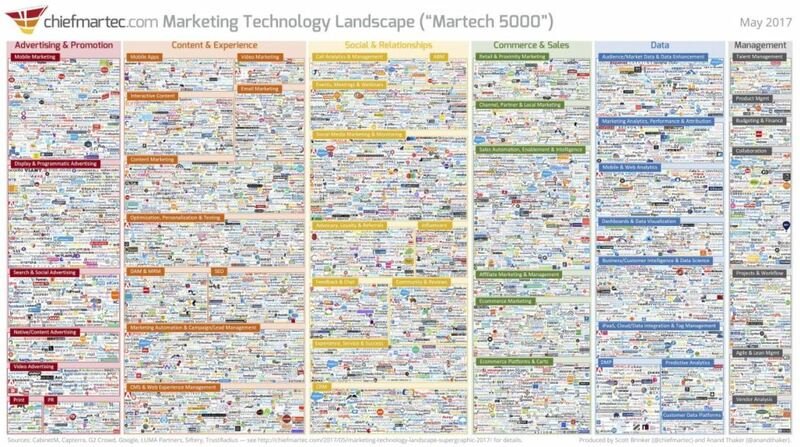 According to MarTechToday, “The Marketing Technology Landscape has now reached nearly 5,000 vendors” (as of May 2017) and grew by 40 percent in the previous year (just try to see the attached chart). That’s a lot of integration and automation for companies to digest in 2018. Think of it as a meta-issue, not a megatrend, and budget accordingly over time. Take bites you can digest and work your other channels. This entry was posted in B2B Marketing, Channel Preference, Customer Behavior, Customer Experience Research, Customer Segmentation, Digital Marketing, Marketing Automation, Social Media CRM and tagged B2B Marketing, Channel Preference, Content Marketing, Customer Behavior, Customer Experience Research, Customer Segmentation, Digital Marketing, Marketing Automation, Social Media CRM. Bookmark the permalink.